Yesterday, in honor of the beginning of this year’s Columbus Spring Pilgrimage, we had a short introduction to the inaugural Columbus Pilgrimage, held April 14-16, 1940. Today’s post contains information about the twenty-two antebellum homes featured in that inaugural Columbus Pilgrimage. The description and photographs are from the “Program and Historical Facts” booklet published for the 1940 Pilgrimage. The booklet is 82 pages of information about historic Columbus houses, as well as the city in general in 1940. It may take a moment to realize that, amazingly, today in 2016, we are farther away chronologically from the Columbus of 1940 than they were from the Civil War (or as 1940-era Columbus Pilgrimage participants referred to it, the War Between the States). A note on the text: All the text in quotations has been left as-is by me as there are almost no grammatical errors (plus the authors loved extremely long sentences joined by commas, semicolons, conjunctions, em dashes, and whatever bits of English language were lying around, typically with at least one list of objects, and something I obviously share). Notes in italics are mine and reflect current (and sometimes corrected) information about each house. Architectural history, especially when pertaining to antebellum architecture of the Deep South, was not even in its infancy; it was still in the womb. The Society of Architectural Historians was founded in 1940. J. Frazier Smith had not yet published White Pillars: The Architecture of the South; it would come out in 1941. What was written about Southern architecture in the 1920s and 30s largely pertained to the older cities in the Upper South, places such as Alexandria, Georgetown, and Williamsburg. That explains the fact that nearly all the houses featured in the 1940 Columbus Pilgrimage are “Colonial,” regardless of what they actually look like. Terms such as Greek Revival, Italianate, and especially, Columbus Eclectic, were either not widely circulated or had not been invented yet. But, there are no “Colonial” houses in Columbus except those Colonial Revivals created during various Twentieth Century periods. “The Franklin Home has been in the family for five generations, having been built by Samuel B. Malone in the early forties, and bought by the Franklin family in 1871. It is brick Colonial, with two stories and a basement; with front and side entrance exactly alike. An old fashioned brick wall surrounds the formal garden, with many rare plants. A cooling brook waters the sunken garden of wild flowers and ferns. In 1917, this lovely home of Mr. and Mrs. Henry M. Pratt was inherited by Mrs. Pratt; she being the granddaughter of the late Dr. Sydney Franklin. Through the Franklin regime in the past, and now in the present, this hospitable southern home has kept open house for old and young. The portraits of five generations give tone and character to the rare furnishings left this cultured family, as a legacy of the past. Mr. Pratt is co-chairman of the Pilgrimage” Still-extant, The Franklin Home (today known as Franklin Place or the Pratt House) is listed on the National Register as part of the Factory Hill-Frog Bottom-Burns Bottom District and located at 423 3rd Avenue, North. The house and grounds are today, rather remarkably, still nearly identical to the 1940 photograph. It is not part of the 2016 Pilgrimage. “Camellia Place – The home of Mrs. John Morris Morgan, was built by a celebrated architect, J. S. Lull, in the early forties, and is now owned by Mrs. John Morris Morgan. It is built of brick, with white Colonial columns; the only one of our ante-bellum homes left, occupying a whole city block. It stands at an impressive distance from the street amidst one of the handsomest collections of camellias in the south – hence its name Camellia Place. The halls and parlors are finished with massive cornices of the finest carving, and with circular arabesques ornamenting the ceilings. In the double parlors, the mantels are of imported marble, with an inset mirror – all onyx trimmed. The rosewood furniture is upholstered in damask. Rare treasured antiques will be of interest to many. A mahogany spiral stairway leads to the third story. A full-length portrait of the late Mrs. Louise Morgan Kaye, by Frank Salisbury, a celebrated English artist who painted one of the most impressive portraits of King Edward VII, attracts immediate attention, amid other handsome portraits.” Still-extant, Camellia Place is located at 416 7th Street, North and is not listed on the National Register. The house does not retain its entire square block lot; roughly one third of it was parceled off and redeveloped sometime after World War II, judging by the styles of the generally bland buildings built on that part of the grounds. The house was local builder-architect James S. Lull’s own house, but the interior largely dates from an 1880s remodeling. 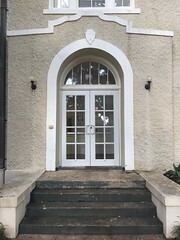 The loss of part of its grounds and the Victorian remodeling are likely reasons why Camellia Place is not on the National Register. It is not part of the 2016 Pilgrimage. “Maydrew Manor – Home of Andrew Puckett and family, built in 1835 by Richard Sykes. It is set in spacious grounds with its rustic arbor and many trees – truly a “Birds’ Paradise,” a name given it by a former owner. Its unusually thick walls and huge brass door key intrigue all visitors. This has been the home of many distinguished families. For years it was owned by the Leigh family – one of the sons, Joseph Leigh, was an eminent lawyer at the Columbus Bar. A son of Richard Sykes, Capt. E. T. Sykes, also a lawyer of distinction, was born here, and in later years was the home of the Middleton Wootten family, Mrs. Wootten being the grand daughter of two governors – Gov. James Alcorn of Mississippi and Gov. Rector, War-governor of Arkansas. Mr. and Mrs. Puckett have improved it, showing taste and appreciation of the period of its building in furnishing and landscaping. The old fashioned garden is in evidence with formal rose garden and lily pool, in which the loveliness of the trees is reflected.” Still-extant, Maydrew Manor is known today as Rosewood Manor or, in the MDAH HRI, the Sykes Leigh House. The House (by whatever name you want to call it) is listed on the National Register and located at 719 7th Street, North. The house retains large grounds which have collected an assemblage of buildings moved from elsewhere. It has had numerous porches and porticos over the years, the current version could be dubbed version 3.1. Created sometime after the 1985 National Register listing, the current portico retains the columns seen in the 1940 photograph but replaced the restrained Doric capitals with garish, grossly disproportionate Corinthian capitals. Maydrew/Rosewood Manor is part of the 2016 Pilgrimage. “Leigh Crest – the F. M. Leigh home, is an imposing example of Southern, Colonial architecture. It was built by Dr. A. N. Jones, an early physician of Columbus, who purchased the site and several adjoining acres, in 1841, from Judge Joseph Field. More than sixty years ago, the place was purchased by Capt. Frank M. Leigh. Among the distinguished guests who visited this homes, was Mrs. Clem Clay Clopton of Alabama; who, in her book “The Belles of the Fifties,” wrote delightfully of life in Columbus before the War Between the States. Flowering shrubs, jasmine, and old-fashioned Boxwood, in parterre arrangement make the surrounding garden on of the few remaining examples of a typical Southern garden. It contains priceless mahogany and rosewood furniture, large mirrors that reach to the ceiling, and family portraits; the work of famous artists. One of the most complete china collections in Columbus will be on display. This home is still in possession of the heirs of the Leigh estate.” Still-extant, Leigh Crest (largely spelled as Leighcrest today and also known as the Jones-Banks-Leigh House) is listed on the National Register and located at 824 7th Street, North. The noted gardens are also still extant as Leighcrest has among the largest remaining grounds of any antebellum Columbus house. The house is believed to be an early commission by James S. Lull, displaying characteristics of his known designs. It is not part of the 2016 Pilgrimage. “The Cedars has been the residence of the Randolph-Sherman families since 1835. This was the second house to be built in Columbus. It is constructed of logs and retains its original features, except for the addition of more rooms and a veranda. Though the first to be built, it is one of the last of the old homes to remain on this hill. Its timbers remain sound after more than a century. Much gold and silver was taken care of in this house, when Capt. Randolph was a receiver of Public Money from the Land Sales of that early era. This house served as a haven for sick and wounded soldiers during the War Between the States. General Forest was under this roof-tree; so was General Grierson of the Federal Army, when he came to return mules taken by some of his soldiers. The portrait of the first Setter Dog brought to this section hangs on these walls. In its archives are old historical books, Land Grants, etc., bearing the signatures of early Presidents. Among the relics, are silver spoons, with the crest of Colonel Byrd of Westover, and a sash worn by Capt. Randolph in the battle of Lundy’s Lane.” Still-extant, The Cedars is listed on the National Register and located at 1305 Military Road. It is part of the 2016 Pilgrimage. “Temple Heights, the Kennebrew home on the Highlands, is a Colonial residence, built in 1843 by General Richard T. Brownrigg, a pioneer settler of Columbus; later the home of Mrs. Jane Fontaine, one of the group of women who inaugurated the First Decoration Day in 1866. You will observe that the architecture is suggestive of the Parthenon – a Greek revival interest; hence the name Temple Heights. Artists and teachers point out this admirable example of noble simplicity, beauty, and harmony in Doric style. As originally planned, the colonnade was to have extended on all four sides of the house. In the double parlors, are Persian, marble mantles. It was purchased by the J. H. Kennebrew in 1887, and his daughters still reside there. The timber in this home, like many other homes in Columbus, is from virgin forests and built by slave labor [note: this is one of only five mentions of slavery in the entire 82 page booklet, all associated with the construction of houses].” Still-extant, Temple Heights is on the National Register and is one of only two antebellum Columbus houses protected as Mississippi Landmarks, the other is the Blewett-Harrison-Lee House (Stephen D. Lee House). Located at 515 9th Street North, Temple Heights has from the very beginning been a Pilgrimage mainstay and is part of the 2016 Pilgrimage. “Meek Home – built in 1854 by Col. William R. Cannon, it has been occupied by five generations. Col. Cannon’s daughter married S. M. Meek, and his widow married Alexander B. Meek, the poet, hence the name is established. In 1883, after a meeting of the Mississippi Press Association, the entertaining inspired these words in the Yazoo Herald: “To visit Columbus and not visit Col. Meek’s home would be like leaving out the Capitol when going to Washington.” A banquet was tendered Hon. Jefferson Davis in this home in 1860 during a political campaign. Governors Quitman, McWillie, and McCrae have been guests, and while the Selma, Marion, and Memphis R. R. was under construction, Gen. N. B. Forrest, the company’s president was a house-guest of his friend, Col. Meek, who was general counsellor for the road. It is of old colonial architecture, multi-colored Venetian glass surround the doorway, and the old brass key still in use. The historical relics on display are Powhatan’s tomahawk, field-glasses given by Louis Napoleon to Gen. Forrest, who presented them to Col. Meek, rare books, a Bohemian punch-set, a bridal gift to Mrs. Cannon from A. P. Bagby, Ambassador to Russia; portraits of five generations, silver, china, and original furniture. Now occupied by Mr. and Mrs. B. K. Sessums and Mrs. Julia Meek Gerety.” Still-extant, the Meek Home is today known as Wisteria Place (presumably for the large wisteria vine that has been grappling to the death with an equally large magnolia in the front yard for likely well over a century) and is located at 524 8th Street, North, at the corner of 6th Ave, North and 8th Street, North, directly behind Temple Heights. Wisteria Place is not listed on the National Register and is not part of the 2016 Pilgrimage. “Dawnview – Home of Mrs. Laura Lipscomb Beard, was built in 1856, by W. H. O’Neal, one of the early settlers who became one of the leading architects of his day. It was later owned by Charles E. Dancy, Mayor of Columbus, for a long period. The location is unique, in being at the intersection of five streets – one, the historic Military Road. The architecture of Dawnview is attractive, with lattice enclosed basement and arched entrances. Note the double front steps and triple doorways. In this home, Dr. W. L. Lipscomb, distinguished physician, educator, and author of the History of Columbus, resided with his daughter for a number of years. Dr. William Lowndes Lipscomb was one of the most gifted Columbus citizens in the nineteenth century.” Non-extant, Dawnview is listed in the MDAH HRI as the O’Neal-Beard House and was located on a triangular plot of land where Military Road terminates at 3rd Avenue, North and 8th Street, North. The house was destroyed before 1960, and the site contains an offensively bland brick box apartment complex. One can see some of Dawnview’s remaining retaining wall along Military Road. Despite being Columbus’s largest pure version of the Cottage Orné style (the Columbus Eclectic Style is a unique, more muscular local variation blending Cottage Orné with typical Temple-style porticos), Dawnview is nearly completely forgotten and undocumented, with no published information available on the house, not even in Mary Carol Miller’s excellent Lost Mansions of Mississippi books. “Hamilton Hall – The present home of Mr. and Mrs. Coleman Hamilton, was built by Governor James Whitfield, as a wedding gift for his oldest son, Henry Whitfield, in the early forties. Later, it was bought from Marcellus Hatch by E. S. Moore. It remained in the Moore family for three generations, and was then bought by the present owner. The architecture is of Italian design, with the original old fashioned blinds. Like so many of our old homes made of brick, it was built by slave labor. It has cast iron balconies and trimmings. The old fashioned garden makes a fitting frame for this charming Southern home. On the interior, one finds spacious rooms, with hardwood floors, high ceilings, and mouldings carved by hand, in conventional design. Antique furniture, glassware, and other historical collections will give one an interesting visit to Hamilton Hall. The unique Dutch Breakfast room in the rear of the hall presents a charming vista.” Still-extant, Hamilton Hall is known today as Baskerville Manor (although many, like myself, would presume it is renamed by someone who is a Sherlock Holmes fan, Baskerville is the maiden name of the current owner) and located at 905 3rd Avenue, North. The house, by whatever name, is not on the National Register, despite having the only coach house left in Columbus, according to today’s Pilgrimage organizers. It was constructed in 1860, not in the 1840s. This house is part of the 2016 Pilgrimage. “Snowdoun – the John M. Billups home, built in 1854 by Gov. James Whitfield, purchased by Maj. Billups fourteen years later, is now occupied by Mr. and Mrs. Willis Garth and Miss Mary Billups. It was patterned after Monticello, the home of Thomas Jefferson. An arresting feature is the octagonal hall with winding stairway leading to the upper octagonal hall. It has twelve rooms. From the upper balcony Jefferson Davis spoke just prior to the Civil War. In the home is a crutch that was used by Gen. Nathan Bedford Forest, a battle flag carried by the famous First Mississippi Regiment in the Battles of Monterey and Buena Vista in the Mexican War, and framed nearby is a letter from Jefferson Davis, who commanded the regiment. Also to be seen is a cut-glass medallion of George Washington presented to Mrs. Billups’ great, great grandfather by Lafayette under whom he served in the Revolutionary War. Originally there were eight of these medallions but now only two are in existence, the other being owned by Mrs. F. Louis Mora of New York. There is also a collection of swords and firearms, rare books, and valuable letters. Music lovers will see with interest a violin bearing the inscription: “Antonius Stradivarius, Cremonenni, Faciebat, 1756.”” Still-extant, Snowdoun is still known today as Snowdoun and located at 906 3rd Avenue, North, across the street from Hamilton Hall/Baskerville Manor. Ignore all that nonsense about Snowdoun being based on Monticello. While Whitfield did visit Monticello after the Franklin Pierce inauguration and perhaps got the idea to construct a unique house from Jefferson’s home, if Snowdoun is Whitfield and his architect’s idea of what Monticello looks like, then they were both blind. Snowdoun is patterned after the “Anglo-Grecian Villa” in William Ranlett’s 1849-51 books The Architect, with perhaps some influence from Orson Squire Fowler’s The Octagon House: A Home for All. After more than a century as the Billups family’s personal museum, none of the interesting artifacts remain at Snowdoun, as the house was “completely remodeled” by new owners in the 1990s. Snowdoun is on the National Register but is not part of the 2016 Pilgrimage. “Shadow Lawn – Present home of Mr. and Mrs. T. Arthur McGahey, was built by Mr. J. N. Spears, in 1860. In 1925, it was bought by the present owner, Mr. T. Arthur McGahey, an outstanding business man of Columbus. It was built by slave labor, out of virgin pine, walnut, and other excellent woods, that abounded in the virgin forests in that day and time. It is distinct Colonial architecture, with lovely Corinthian pillars, and side lights of rare Venetian glass. The name Shadow Lawn was suggested by the flickering shade of the elm trees that line this boulevard, we call College Street. This lovely home is filled with antiques in an exquisite setting.” Still-extant, Shadowlawn is today spelled as one word and is located at 1024 College Street. It should be called “sunnylawn” since all of the large elm trees mentioned are gone, victims of Dutch elm disease. Some large trees still existed in the 1980s to provide shadow to the lawn, but now there is only country club lawn sprinkled with bushes. The house is listed on the National Register as a notable example of Columbus Eclectic architecture and is part of the 2016 Pilgrimage. “Flynnwood – The home of Mrs. Carrie Richardson Flynn, was built around 1850, by Abram S. Humphries, whose family occupied it for several generations. It 1919, it was sold to the late G. M. Flynn. A noteworthy feature of this handsome Colonial home, in the heart of Columbus, is the lovely fan-shaped, Venetian glass, outlining the Colonial front door, which artists have delighted to copy as a typical Southern mansion entrance. Inside this handsome home, one will find the same lovely spacious halls and rooms of all Southern homes, with arabesqued ceilings and marble mantels – an appropriate setting for the antique furnishings that make Flynnwood one of the outstanding homes in Columbus. During the War Between the States, this home was thrown open to our wounded soldiers, as were so many of the old Columbus homes. Even the velvet curtains were cut up by the Humphries family and made into needed bed-coverings for wounded soldiers.” Non-extant, Flynnwood was located at the southeastern corner of College Street and 7th Street, South on the current site of the undistinguished brick box that is Ralph “Chicken” Webb Fire Station 1. Unlike the obscure Dawnview, Flynnwood is well-known as one of Columbus’s worst historic losses, both as arguably the best example of Columbus Eclectic and for the manner of its demolition. 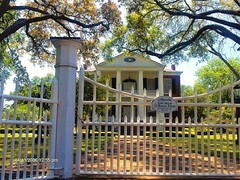 Flynnwood was written about in both of Mary Carol Miller’s Lost Mansions of Mississippi books. Miller provides a recounting of Flynnwood’s history and demise, which I will very briefly summarize here (go read the books for more information). Flynnwood partially burned in 1966 and was dismantled, to be combined with the also dismantled Colonel Thomas White House of Hernando into what would have been a strange hybrid mansion in Southaven. Both houses were stored somewhere near Horn Lake; which is the end of the story because no one knows what happened to the houses after that. “Homewood – was built in 1836, by W. M. Cozart, and passed into the hands of the late John K. Ottley in 1869. It was bought by John T. Wood, financier of Columbus, in 1894; now owned by Mesdames Vesta Wood Billups, Hattie Wood Norman, and Louise Wood Cox, daughters of John T. Wood. It is Colonial architecture, with a long veranda, supported by massive columns – all painted white, with green blinds. The interior arched doors have old brass door-knobs. Red Venetian, cut-glass side-lights, at the two entrances are typical of that period. The up-stairs hall is a replica of the lower hall. Handsome antique furniture, silver, and glassware will be of interest to many. Mr. and Mrs. James Sykes Billups and their three children: James Sykes (Lt. U. S. A. ), Marcella, and John Wood Billups; and Mrs. Louise Wood Cox, and her son Jim William Cox, now live in this lovely home.” Still-extant, though anyone who visited it during the 1940 Pilgrimage would be flummoxed to find it today. 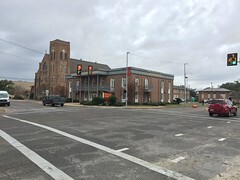 In 1940, Homewood was located at 702 Main Street and was Main Street’s last antebellum house (the only identifiable antebellum building on Main Street today is First Methodist Church, which was not completed until 1866, though some commercial buildings in the 400 block may have antebellum components). Homewood was relocated October 1975 (when HABS documentation was done on it) to 800 2nd Street, South, in a rather botched move that led the half of the house collapsing. 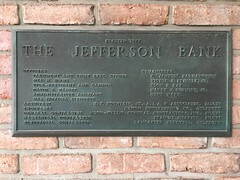 A bank occupies its former site. Although listed on the National Register as part of the South Columbus Historic District, Homewood has had various changes on the interior and exterior due to and since its move, such as the replacement of some interior woodwork (including much of the stair) and a completely inappropriate dryvit-covered addition that dominates the original house. Homewood is not part of the 2016 Pilgrimage. “The Old Homestead – Home of Mr. and Mrs. H. C. Farrow, is one of the oldest in the city. The lines of the original house have not been changed; yet inside all improvements to meet modern convenience have been added. The house was built by James Wynne in 1846, and in 1859 was bought by Dr. James W. Hopkins, who was a physician of prominence. Dr. Hopkins rendered distinctive service in the local hospitals for the wounded soldiers during the War Between the States, and after his death in 1870 the home became a citadel from which his daughter and sons marched forth in the battle of life. He reared a large family, who became outstanding citizens; one of whom, Mr. Edward R. Hopkins, an octogenarian, is versed in the history of the city, and is an acknowledged authority in that line. Mrs. Farrow has antiques and heirlooms in this home, which came through many generations of her family.” Still-extant, The Ole Homestead is listed on the National Register as part of the South Columbus Historic District and located at 302 2nd Avenue, South. Columbus historian Rufus Ward and his wife received the 2014 Trudy Allen Award for residential restoration in Mississippi from the Mississippi Heritage Trust for their work on The Ole Homestead. It has from the very beginning been a Pilgrimage mainstay and is part of the 2016 Pilgrimage. “Twelve Gables – The home of Mr. and Mrs. Henry Bowlin, was built in 1838. In 1938, one hundred years later, it was restored by the present owners. An historic fact of interest is, that, in the parlor of this home, then the residence of Miss Matt Morton, was conceived the idea of Decoration Day, the first observed in the United States, on April 25, 1866; when flowers were placed alike on the graves of Southern and Northern soldiers in Friendship Cemetery. This act inspired the poem, “The Blue and The Gray,” by F. M. Finch. Miss Morton was the daughter of John Morton, who built Twelve Gables and whose family for four generations resided there. Mr. and Mrs. Henry Bowlin, with pride and interest, have beautifully restored the house and garden. During the War Between the States, this home was thrown open to the wounded soldiers.” Still-extant, Twelve Gables is listed on the National Register as part of the South Columbus Historic District and located at 220 3rd Street, South. It is not part of the 2016 Pilgrimage. “Riverview – The home of Mr. J. W. Burris, was built in 1847, by Colonel Charles McLaren [sic], with slave labor and home-made brick. This imposing home, with the rear architecture a replica of the front, was intended by Colonel McLaren [sic], at his death, to be bequeathed to the city, as a school for girls; but circumstances changed his original plans, and it was purchased as a home by John Gilmer; and later acquired by Captain W. W. Humphries, whose daughter married the present owner. The porches of this mansion have marble floors. There are also mantles of black Italian marble, and gorgeous wall mirrors. Note the circular stairway rising to the observatory. The ceilings, with rich ornamentation, are twenty-two feet in height. The past still lives in the old brick kitchen and servants’ quarters in the yard. A collection of antique china, silver, and furniture, associated with homes of this grandeur, and preserved intact, are reminiscent of the elaborate entertaining of the old south.” Still-extant, Riverview is Columbus’s only National Historic Landmark, designated in 2001, and is located at 514 2nd Street, South. Riverview was a new name for the house in 1940; before the inaugural Pilgrimage, it was known as the Charles McLaran House (note McLaran is correctly spelled with a second “a,” not an “e”). Simply put, Riverview is the biggest and best architectural work in Columbus, which does not lack for such large, high-quality historic architecture. Riverview is a larger version of Camellia Place, both the work of James S. Lull. Riverview’s scale is verging on the ridiculous; with the downstairs ceiling height and room proportions almost rendering people down to ant scale. It is not part of the 2016 Pilgrimage. “Woodward Home – This house was built by A. G. Weir in 1833. It was sold to Mr. Richard Sykes in 1850. It was then purchased by Colonel William C. Richards in 1872 and has been in the possession and occupied by the descendants of the Richards family since that year. It is considered one of the state’s best examples of the Southern Planter’s type of architecture. The first or basement floor is of brick with inside walls of brick throughout and low ceilings. The upper floor is more formal in architectural design with large rooms and high ceilings. Much of the mahogany furniture and furnishings of this home were brought out from the great-great grandparents’ home in North Carolina. A distinctive feature of this house is the double stairway which leads to the upper floor making an unusual entrance to the house. The Ionic columns are of solid logs. The brick walls which surround the grounds were built shortly after the Civil War [note: one of only two mentions of “Civil War” in the booklet, all other references are to the War Between the States] from the brick of the old Confederate arsenal which was destroyed by fire. This home is now owned by Mr. and Mrs. J. P. Woodward.” Still-extant, the Woodward House is known by various names such as the Pratt-Thomas House (which is what it is listed under in the MDAH HRI), Adolphus Weir House, and Richards House. By whatever name, the house listed on the National Register as part of the South Columbus Historic District and located at 519 2nd Street, South. It is not part of the 2016 Pilgrimage. “Lehmquen – The home of Dr. and Mrs. Charles Edward Lehmberg was built in 1838, by Judge George R. Clayton, an eminent statesman of Georgia, who moved to Columbus in 1834. Dr. Lehmberg has owned the house for the past twenty years. This is an interesting example of the Colonial Cottage, featured in the pre-war period. The rooms are unusually large, with high ceilings, wide board floors, and handsome woodwork. Attention is called to the old-fashioned silver door knobs. The charm of this place is further enhanced by the old iron fence and the garden with an attractive landscape effect. Here, as elsewhere in Columbus, a lover of antiques will find furniture, silver, old laces and costumes of soft tinted silks. 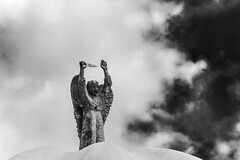 Mrs. Lehmberg is a granddaughter of Mrs. Augusta Murdock Sykes, who was one of the four young matrons of the Sixties who decorated alike the graves of the soldiers who wore the “blue and the gray,” and lie buried in our Friendship Cemetery. This generous act inspired F. W. Finch to write the immortal poem, The Blue and the Gray.” Still-extant, Lehmquen is listed on the National Register as part of the South Columbus Historic District and located at 613 2nd Street, South. Lehmquen has been owned for many years by architect and noted architectural author/editor Robert Ivy, Jr. It is not part of the 2016 Pilgrimage. “The Colonnade – The home of Mr. and Mrs. Joe Street, was built by William T. Baldwin, in 1860, and occupied by the Baldwin family until 1935, when it was purchased by Mr. and Mrs. Joe T. Street. One interesting fact about this typically Southern, Colonial home is that the upright framework is pegged together. After the battles of Shiloh and Corinth, many wounded and sick soldiers found this hospitable home a refuge, and received tender ministration until they returned to the battle front. Here one finds that modern conveniences have not overshadowed the atmosphere of the Old South. A well-known artist, Mr. William Steen, immortalized this house on canvas, as typical of a true, Southern home.” Still-extant, The Colonnade is listed on the National Register as part of the South Columbus Historic District and located at 602 2nd Street, South. The Colonnade has an interesting half-peristyle colonnade (hence the name of the house) that is a unique feature in Columbus. The Colonnade Garden, typical of antebellum urban Columbus gardens with boxwood maze and formal plantings, is part of the 2016 Pilgrimage (though the house itself does not appear to be open for tours during this year’s Pilgrimage). “Whitearches – Was built in 1857 by General Jeptha Vining Harris. In 1873, this attractive home passed into the hands of Colonel James Oliver Banks, brother-in-law of General Harris. It has been occupied by the Banks family ever since. Whitearches has a wide veranda, outlined with a succession of white arches, spacious cross-halls, imposing entrance, with Venetian glass side-lights. You will be interested in seeing the antique furniture, glass-ware, silver, and rare Italian harp that this family have enjoyed for many generations. In the yard, are some of the loveliest camellias in Columbus – the rare white variety which blooms luxuriantly. The present owners are Mesdames Lucy Banks Maxwell, Anna Banks Harris, and Wiley Coleman Banks; children of Colonel Banks and Lucy Young Banks of Waverly, the Young ancestral home.” Still-extant, White Arches (spelled as two words) is listed individually on the National Register as one of the best and most creative examples of Columbus Eclectic architecture, blending Greek Revival, Italianate, and Gothic Revival/Cottage Orné styles. The house is also part of the South Columbus Historic District and located at 122 7th Avenue, South. White Arches has from the very beginning been a Pilgrimage mainstay and is part of the 2016 Pilgrimage. “Whitehall – Was built in 1843 by James Walton Harris, great grandfather of the present owners. It is Georgian Colonial, plain in design, with simple lines of strength and beauty, and furnished throughout in original antiques. The home originally occupied an entire city block, surrounded by its terraced gardens, servants’ quarters and stables. Three sons from Whitehall, went into the army of the Confederacy: Captain Jeptha V. Harris, Third Battalion, Minute Men, Lowndes County, Captain Company D, promoted to Brigadier-General, September 2, 1862, also a surgeon C. S. A., William H. Harris and J. W. Harris, Columbus Riflemen, mustered into the service of the Confederate States Army at Corinth, Miss., May 27, 1861, known as Co. K – 14th Miss. Regiment Infantry. During the Civil War Whitehall was set apart and used as hospitalization of Confederate soldiers. It has been continually in the same family for five generations. Mr. and Mrs. Thomas Carleton Billups and Mr. James Harris Hardy, are the present occupants. Today it is presided over by Mrs. Billups, chairman of the Columbus Pilgrimage who was active and influential in inaugurating this movement in Columbus. Whitehall stands today mellowed with age and still sharing in the city’s social life. Still-extant, Whitehall, a nice Greek Revival house, is listed on the National Register as part of the South Columbus Historic District and located at 607 3rd Street, South. It is part of the 2016 Pilgrimage. “Waverly – Built in 1856 by Col. George H. Young. Seven miles from Columbus. Open at any hour; entrance fee, 25¢; present owner, Mr. George Young Banks. Waverly, situated on the west side of the Tombigbee River on Mullen’s Bluff, was built in 1856 by Col. George Hampton Young, who came to this section in 1835, to attend Land Sales, and bought this tract from Alexander Pitchlyn. Waverly is still in possession of a branch of this same Young family, Mr. George Young Banks, a grandson. This house was a typical rich planter’s home, with all the conveniences possible for that day and time, even to an outside ice-house. For many years most of the costly furnishings remained in this antebellum home. On entering the octagonal hall on the first floor, one may look through four floors, without an obstruction, to the cupola on the roof. Hanging from the ceiling to the first floor is a beautiful chandelier of wrought iron and crystal. All of the mantles in this house are of imported marble. The parlor mantel was further enhanced by the large gold leaf mirror brought from France. Note the handsome double stairway, with all rooms opening onto the balcony.” Still-extant, Waverley is a National Historic Landmark, designated in 1974 and located at 1852 Waverly Road, between Columbus and West Point in rural Clay County. While referred to as a “typical rich planter’s home,” Waverley, like Riverview, does not resemble typical in any way, which is why they are both National Historic Landmarks. Amazingly, Waverley had been uninhabited for twenty-seven years when it was featured in the inaugural Columbus Pilgrimage; it would remain in that state for another twenty-two years, until 1962, when Robert and Donna Snow purchased and began restoring the house. The Snow family still owns the house, with Robert Snow celebrating his 90th birthday there in November. It is part of the 2016 Pilgrimage and is open for regular tours. That concludes the Tour of Homes portion of the inaugural 1940 Columbus Pilgrimage. Of the twenty-two homes featured, twenty are still extant, with only a few of those having any noticeable alterations. Tomorrow, our series of posts on the inaugural Columbus Pilgrimage concludes with another tour of historic houses. Thank you so much for these wonderful posts on Columbus Pilgrimage. Enjoyed reading about every home. The homeowners are so gracious to welcome those who love historical architecture. Remarkable that so many are still loved and lived in. Thank you and corrected. See, that is why I left the original Pilgrimage booklet unedited. It took me less than two paragraphs to make a grammatical error. Dawnview is a revelation to me, as is the peculiar saga of Flynnwood. Fascinating and tristful, both. Thank you. Yes, with some Craftsman influences. It falls into the initial Twentieth Century period of Colonial Revival being en vogue. Whoever owns the Bethea House needs to get to painting; the siding is more bare wood than paint. The house is in the Hercules aquifer contamination zone and is probably owned by “one call, that’s all” Richard Swartz who is running the class action suit . I know of one home owner, two houses west of the Bethea home, who settled out of court for around $3,500,,000 and left for Colorado.. The Bethea home has been in need a paint job for years. And it’s living proof of the viability of South Mississippi virgin grow long leaf yellow pine construction materials. Baskerville is the maiden name of the current owner. Thank you for the information. No books or guides that I found stated why the house was now called Baskerville Manor. 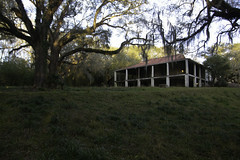 Riverview will be restored…by a Realtor with a heart.